It is twilight and we are many hundred meters above sea level and the ground all around us is blanketed in a thick wet mass of ice and slush and powder. It is dark and we are cold. We want to camp but there is nowhere to camp. Nowhere suitable for a picky pair of campers like us, anyway. I suppose we can camp in the snow. I suppose that's something people do. But our tent is thin and technically billed as a "three-season" tent. Nowhere does it list which three seasons it covers, but my money's on all the ones that aren't winter. Because of the snow. Because camping in the snow is nowhere near as fun and enjoyable and comfortable as camping in the not-snow. Earlier, it was hot. Earlier we were sweating. Earlier we were cycling across the Slovenian lowlands and huffing up ancient, crumbling goat trails and climbing toward a mountain pass on the Slovenian-Croatian border that we didn't realize would be quite so alpine. And now, it is frigid. Now our sweat has cooled and begun to sap heat from our bodies. Now we a few kilometers into Croatia and suddenly smacked with the acknowledgment that we've maybe arrived a little too early in the year. Our first day on the bikes since leaving France two weeks ago has been neither fun nor easy. Our leg muscles have atrophied during our fortnight of sloth in Muggia, and now there are hills. We have been bickering all day, out of step with one another and our old routine. It has been hot, and then cold, and now very cold. And here we are, atop a mountain pass. On the edge of the Alps. In winter. It is late. We have been cycling downhill from the pass for the better part of an hour. Trying to get beneath the snow line. Trying to find somewhere dry to camp. Our fingers are numb and our spirits deflated. We stop every now and then to inspect a patch of forest and find them all to be unsuitable for one reason or another. Mud. Ice. Thornbushes. We descend further. We coast into a small town. It is as dark and empty as the forest behind us. Few signs of life, spare a shrill, yipping dog down the road. We roll toward the sound of the dog. The canine sits in a yard, barking at everything. It sees us or smells us and then it is barking mostly at us. A woman emerges from the house to see what all the fuss is about. "Hello!" We call out. She asks if we speak German. No, we say. We inquire if she speaks English. Nein, she says. We switch to hand gestures: tent, sleep, pointing a finger at the little clearing across the road from her house. Would it be okay to camp there for the night? Nein, nein. She opens her gate and ushers us into her yard, grassy and dry. It's okay to pitch our tent in the yard? we ask. Oh, thank you! Danke, danke! She shakes her head. Nein. She opens the door and ushers us into her home. It's a warm, lovely evening. The woman tosses some wood into the furnace and feeling returns to our fingertips. She offers us some of her dinner, but it's pretty much all meat, so we cook up some pasta and vegetables for the three of us instead. We drink tea and watch Turkish soap operas and say little. She makes a bed for us in a spare room and plugs a portable heater into the wall. It is toasty and cozy and delightful, this little room on this unexpected night with our generous host in this quaint cottage in this quiet mountain town. We sleep very well. We ride. We ride back to the Adriatic and sidle up along Croatia's pretty coastline. We stop in Rijeka to get my wheel, which I'd amateurishly rebuilt myself back in Muggia (and which has remarkably held together these past hundred or so kilometers) professionally trued and tensioned, just to be sure. The bike mechanic in the first shop we enter is amiable but busy, and asks if we can come pick up the wheel tomorrow afternoon. It has been our intention to continue on past Rijeka this afternoon, but this delay seems like a fine excuse to take a day off. We end up taking three. We spend our first two nights in a pint-sized hostel and our third with a pair of Couchsurfing hosts, a really wonderful young brother and sister sharing a flat on the outskirts of the city. We enjoy a lovely evening of wine and beer and conversation as the wind howls and the sky dumps buckets outside, plus a little more time for pancakes and laughter in the morning. Then, wheel fine-tuned and reaffixed to my bicycle, Lauren and I continue on. Some coasts are flat and marshy and some coasts are rocky, hilly affairs. The Croatian coastline is very much the latter. We spend days climbing up and down the lone, winding road carved between Croatia's imposing grey mountains to our left and Croatia's pretty turquoise waters to our right. It is cold. Very wet. The waterproof gloves we'd picked up in Spain to replace the allegedly-waterpoof gloves we'd started our trip with outperform their predecessors by leaps and bounds. It may be cold and it may be very wet, but our hands remain dry. We ride for some days. We take a two-minute ferry a few kilometers across the sea to the island of Pag, where the barren landscape seems a better fit for Mars (indeed, there's some sort of Bowie-themed "Life on Mars" festival held here, or so the occasional roadside poster tells us) than a Mediterranean island. We pedal south on the long, skinny landmass and it slowly begins to resemble Earth once more, but more precisely Ireland or Scotland: lush, grassy fields grazed upon by big, fluffy sheep, backdropped by dark, snowcapped mountains. It's a harsh yet beautiful place. We head down a dirt track. Our map tells us this track will take us to the actual town of Pag, but reality disagrees. Heaps of gravel and boulders block the entire path. We haul our bikes over them and continue on anyway. The track exists bumpily in certain places and it doesn't exist at all in other places. So we do some pedaling and a little pushing and at times quite a lot of pushing. We startle droves of sheep who do not seem very used to seeing humans and watch them flee en masse up the steep mountainside. We enjoy a lot of quiet, here on this closed road at the edge of a mostly unpopulated island. We reach town and return to actual roads. A few dozen kilometers later, we cross a bridge and roll back onto the Croatian mainland. Lauren's rear shifter cable snaps for a second time (the first broke way back in Namibia). 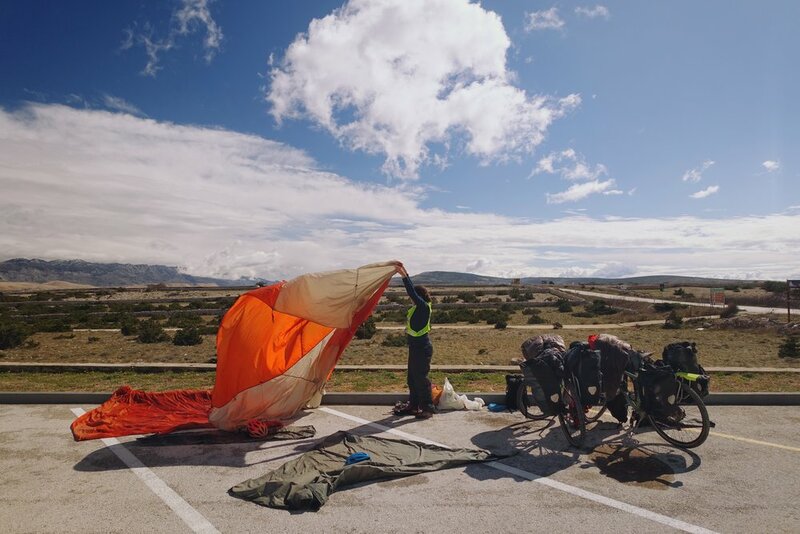 This is good cause to set up camp, and we push our bikes into the nearest forest as the sun sinks behind the powdery peaks of Croatia's Dinaric Alps. In the morning she swaps it out for a fresh cable and we pedal on. We cross the forty-fifth parallel. We are momentariy equidistant from the North Pole and the Equator. We're headed for neither, but we push south toward the latter anyway. South, but only for a little longer. South along the coast. South past Zadar and Sibenik. The road south brings us under large, looming storm clouds and a few more forests and an abandoned construction site in the suburbs of Split where we can camp out of the rain. South brings us, finally, to Split. It has been about a week since we've left Italy. It has been a cold, wet week. I may have mentioned that before. We'd thought winter was on its way out, but it seems to have just stepped outside for a quick smoke before barrelling right back in, enveloped in a thick grey haze, huffing and wheezing up a storm. We're cold and we're tired. It has been months since we've had a place of our own. We've been in Europe since December and it is now March and not once have we actually had a place of our own, set of keys and kitchen and all. We've been the recipients of a great deal of generosity—heaps of it, surely—but we're feeling a little untethered, and could use a little stability for a moment or two. Some privacy. A place to unpack our things. A place where we can leave dirty dishes in the sink until morning and not feel guilty. A place to dry out our tent, perpetually soaked, that isn't a gas station parking lot. Back home, way back when we were boxing up our bikes and quitting our jobs and planning to bike around the world, my really fantastic now-former colleagues had the very kind thought to send us off with an Airbnb gift card for just such an occasion. Private lodging is, of course, expensive. Europe is expensive. This very sweet gift, it helps a lot. The cold helps, too. It is still winter in Croatia, and Croatia is not a winter destination. And so the pricey flats of the Croatian coast, which rent for hundreds of euros per night, are currently sitting vacant. Ample supply, low demand. We find a cozy little Airbnb somewhere in Split for literally a tenth of what it would go for in the summer. We book it for a week. We settle in. We shower and wash our clothes and go to the grocery and buy normal-people quantities of foodstuffs without having to worry about carrying the excess on our back racks. We make piles of pancakes and cook bunches and eat well. We catch up with old friends and walk around Split's old town and otherwise do very little. We get some new bike baskets delivered to our flat to replace the old ones, crudely welded back together down in Zambia and once again coming apart. We draw in our brake pads and don't actually ride our bikes once the entire week. The day before checkout arrives. We think about how nice it'd be if the day before checkout was still a few more days away. We send a message to our host and extend our stay for another few days. We're enjoying this, this simple bout of domesticity. We're enjoying the kitchen and the bed and the shower and the many other small luxuries we go without most days: an electric kettle, a mirror, chairs. We think about how nice it'd be to do this, oh, maybe another few weeks. We search Airbnb (which, for anyone not familiar, is just a website allowing ordinary folks to rent their spare room or apartment or house to other ordinary folks for a day or a week or a month). We are quite flexible. We are broadly looking for a place to stay anywhere south of Split for just about any duration of time, or at least until spring comes. Our requirements are simple: our own place, something cheap, and if we can manage, a seaside view would be rather nice. Travelling with flexibility can be an asset sometimes. I find a pleasant-looking flat with a big balcony that's a bit out of our budget. I notice the place has no bookings on the calendar for all of April. I message the host and ask if, for the guarantee of a two-week booking when it'd otherwise be sitting empty, they wouldn't mind giving us a discount on the price. Sorry, no, they reply. That's okay. I say. Thanks anyway! The next morning a follow-up message arrives. Well, okay, maybe. We're given the place for a steep fifty-percent discount, already very much discounted from summer prices. We book it for twelve (and later extend it to fourteen) nights. There is one catch. It's the end of March and the place isn't available until the first of April. There's a four-day gap between when we must vacate our Split apartment and when we can enter our new flat down in Makarska. They're but sixty kilometers apart, a day's cycling at most. So we have time. I check the weather forecast. It promises sun and warmth. I consult satellite maps of the crowded coastline between Split and Makarska and find one patch of not-terribly-crowded land. We decide on a long weekend of camping, and we set off for the shore.